While fine wines may get better with time, the equipment necessary to run a winery tends to depreciate through the years. Regularly purchasing updated equipment is out of the question for many vintners. While most make the most of the equipment they have, some wineries are turning to equipment leasing to upgrade their equipment and facilities. Equipment leasing allows wineries and other businesses to acquire the equipment and resources they need through innovative financing solutions that work. Growing businesses need to seize the opportunities presented to them. Equipment leasing and personalized financing plans offer practical solutions for wineries of all sizes. Beat Your Budget Restrictions: Limited budgets often keep wineries from acquiring the equipment they need to grow. Equipment leasing requires small monthly expenses rather than large, lump-sum totals. The right equipment lease can flatter even the tightest budgets. Start Using your Leased Equipment Quickly: Use your equipment immediately with simple monthly payments instead of large upfront fees. Unlike a bank loan, there is no down payment or compensating balances required. All it takes is the first and last rental payment and you'll be using the new equipment in no time! Ownership Can Be Expensive: Your profits are generated when you use your equipment, not simply by owning it. Use updated equipment to grow your business without purchasing costly pricey equipment. Keep Your Cash: Keep your cash free for marketing initiatives, working capital, or seasonal cash flow needs. Modern Equipment Can Pay For Itself: Outdated equipment can grow inefficient over time. Leasing new equipment, with more efficient operating rates and updated capabilities, pays for itself over time. Preserve Your Credit Lines: Retain existing lines of credit and borrowing availability for operational and short-term financing needs. Equipment Leasing Finances 100% of Equipment Costs: Equipment leases from Tiger Leasing finance 100% of the cost of the equipment. This includes "soft" costs in your lease too! "Soft" costs can include expenses such as shipping, software, training, and installation. 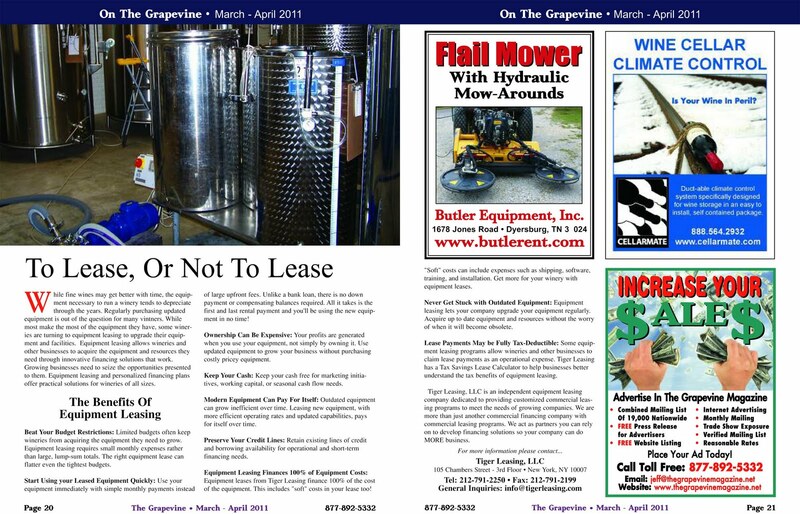 Get more for your winery with equipment leases. Never Get Stuck with Outdated Equipment: Equipment leasing lets your company upgrade your equipment regularly. Acquire up to date equipment and resources without the worry of when it will become obsolete. Lease Payments May be Fully Tax-Deductible: Some equipment leasing programs allow wineries and other businesses to claim lease payments as an operational expense. Tiger Leasing has a Tax Savings Lease Calculator to help businesses better understand the tax benefits of equipment leasing. Tiger Leasing, LLC is an independent equipment leasing company dedicated to providing customized commercial leasing programs to meet the needs of growing companies. We are more than just another commercial financing company with commercial leasing programs. We act as partners you can rely on to develop financing solutions so your company can do MORE business. 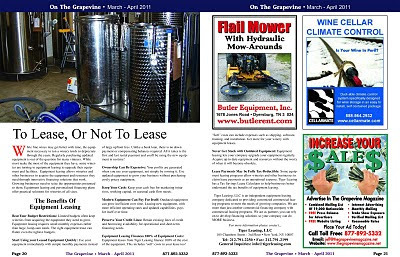 The equipment leasing article above was featured in the March - April 2011 Grapevine Vineyard Magazine. For more information on winery equipment or how leasing can benefit your growing company, please contact Tiger Leasing today!